An Infrastructure providing secure, customizable, personalizable, integrated access to dynamic content from a variety of sources, in a variety of source formats, wherever it is needed. 基於上述的定義, 作者認為與 Internet OSI Model 其實有相近之處, 故在此篇中是以 Layered Architecture 來建立標題中所述的 Portal Application Framework. 共有七層 Layers, 分為三個 Groups, 分別為 Process Interface Layers ,Resource Discovery Layers, 以及 Network Interface Layers. 下圖有各層的簡要 Description, 更詳細的內容可以看 Paper . 但我認為在文章中, 也許限於篇幅, 並沒有深入討論在此 Layered Architecture 之上, 各 Layers 之間透過由 Layers 建構起來的 Abstraction, 得以直接進行 Communication 的行為. 例如 Resource Identification Layer 如何跟另外一個 Resource Identification Layer 進行溝通. 這應該是 Internet OSI Model最重要的特徵之一. 缺乏此敘述, 將會使得各個 Layers 看起來只像是一個 Functional Blocks, 這樣就跟一般的 Block Diagram 沒什麼兩樣了. 同時在 Layers 與 Layers 之間的 Communication 說明也是缺乏. 另外一個問題是, 基於這樣的 Application Framework 所建立的 Portal, 在進行 Deployment 時會有哪些選擇呢 ? 我們在 Network 上有各式的 Routers 或是 AP, 負責了 OSI Model 中數層的工作, 是否對於 Web Portal 而言, 也是會出現類似的概念呢 ? 也許這些問題要到最近幾年的 Conference Papers 裡去找了吧, Magazine 的文章向來比較難以說到細節. 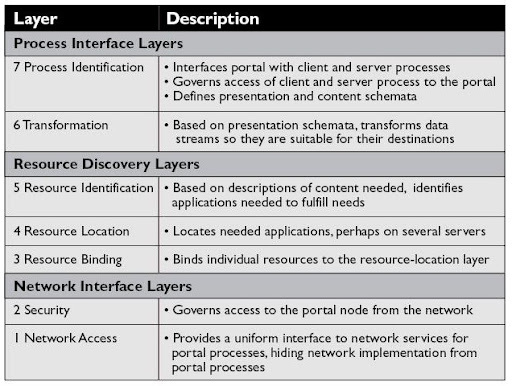 另外也很值得想像的一點是, 既然把此 Layered Architecture 與 OSI Model 對比, 我們是否也可以很合理地想像, 這會變成 Web OS 對應於 Internet Service/Resource 管理使用的一個 Module 呢 ? This entry was posted on 上午10:51 and is filed under paper review , web engineering . You can follow any responses to this entry through the RSS 2.0 feed. You can leave a response, or trackback from your own site.